Why not organise your free Property valuation now? House prices rose by £1,000 a month over the past year with the East of England recording the biggest gains, according to new official figures. A separate report today from estate agents Knight Frank forecast house price to rise by 18.2 per cent between this year and 2019. House price gains have eased back over the past year but property values continue to rise at a faster rate than wages, pushing buyers to stretch even further to afford a move. The average home’s price across the UK has risen from £265,000 to £277,000 over the past 12 months, the ONS said. Property inflation in the East of England hit 9.2 per cent in June, the ONS house price index reported, with the next largest annual gains seen in Northern Ireland, at 9 per cent, and the South East, at 7.7 per cent. The ONS report’s highest rising regions outstripped the UK’s overall annual house price inflation of 5.7 per cent, which has slipped back considerably after hitting a recent peak of 12.1 per cent in September last year. The Knight Frank report suggested that property values will continue to rise over the next five years, albeit at a far more moderate rate than seen throughout the 2000s boom years. That prediction comes as reports suggest that a dearth of homes for sale combined with rising interest from buyers is pushing up prices. 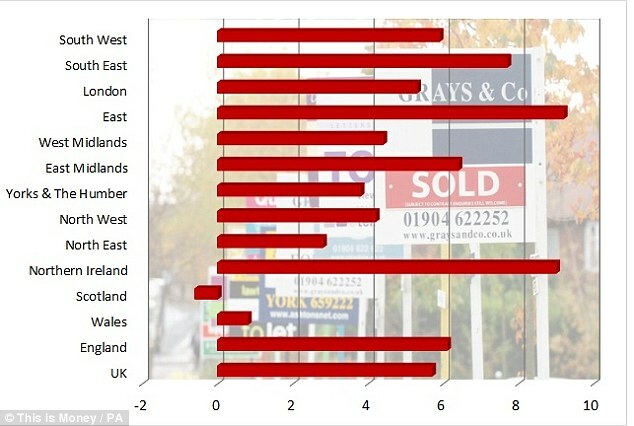 House prices in London are rising at a slower rate than the national average, up by 5.3 per cent over the past year. The ONS index, which lags rival reports from lenders Nationwide and Halifax, is based on data from the regulated mortgage survey. A breakdown of the figures highlights the gulf in prices across the country. The average price in England stands at £290,000, while in Scotland it is £192,000, in Wales it is £169,000 and in Northern Ireland it is £154,000. London was the region with English region with the highest average price at £513,000, while homes in the North East are the cheapest in England, at £156,000 on average. 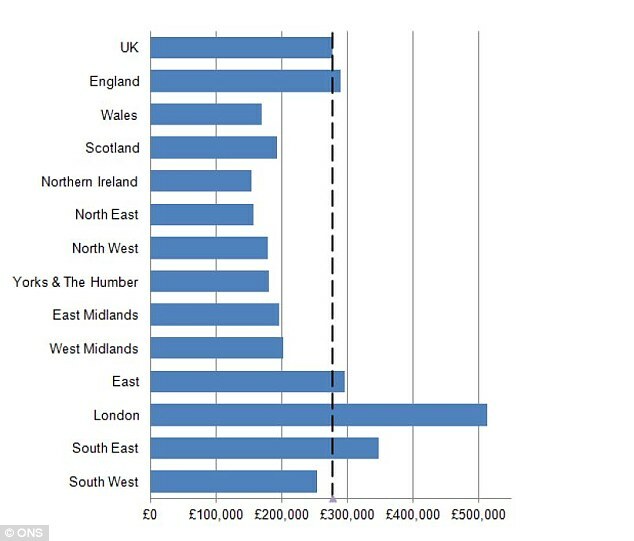 Excluding London and the South East, the average UK house price stands at £211,000, according to the ONS. The ONS report said: ‘Following relatively strong growth during much of 2014, the rate of house price growth appears to have moderated in recent months. ‘On a seasonally adjusted basis, prices grew at a slightly weaker monthly rate of 0.4% while the quarterly rate also eased. The ONS said that the average price for properties bought by first-time buyers increased by 5.1 per cent over the year to June 2015, to £213,000, compared to a 4.8 per cent rise the previous month. Home movers paid £321,000 on average, up 6 per cent on a year earlier, which compares to a 5.9 per cent rise the previous month. The cost of new-build homes was up 9.5 per cent in the year to June. 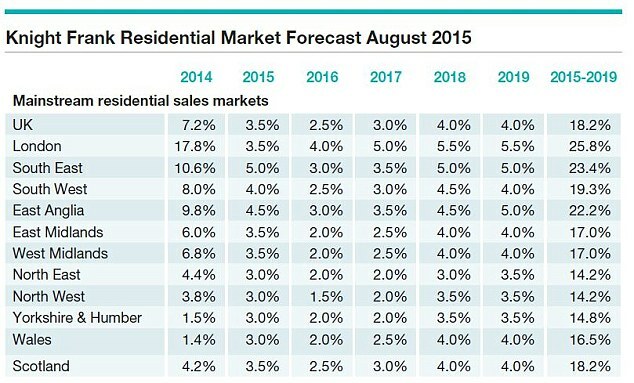 Existing properties are rising in price at a slower rate – up by 5.4 per cent annually. However, new-build buyers are still paying less than those buying existing homes, with average prices standing at £272,000 and £277,000, respectively. Jonathan Hopper, of Garrington Property Finders, said that the traditional summer lull had failed to dent prices but the prospect of rising interest rates would take some steam out of the market. He said: ‘With demand far outstripping supply at most price levels, it’s tempting to see this as a seller’s market. But there’s nothing inevitable about the current price inflation. Simon Lambert. (2015). Homes up £12,000 in a year as lack of property for sale pushes up prices - and agent forecasts an 18% rise by 2019 Read More.